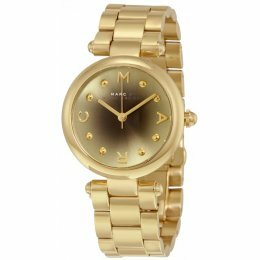 The Marc Jacobs 3454 Ladies Watch has a black dial with gold-tone hands and MARC lettering. It has a buckle closure and is made of scratch resistant mineral crystal. The Marc MJ3454 Watch is a super slim, sophisticated women's watch. 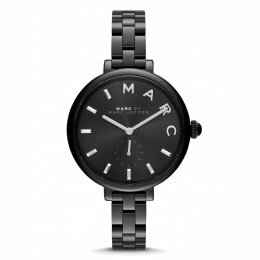 The Marc Jacob Sally MJ1423 is a 3 hand, analog quartz watch. 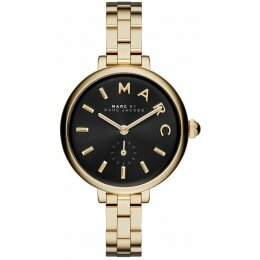 The slim black leather strap of the Marc Jacob MJ1423 Ladies Watch draws the eyes attention to its oversized glossy black face and polished gold-tone top ring. Other features of the Marc MJ1423 Watch include a strap buckle closure and stainless steel case. The Marc Jacob Sally MJ1416 is a Analog Quartz watch with a Gold-tone stainless steel case and a black leather strap. It has a black dial with gold-tone hands and Marc lettering and index hour markers. The Marc MJ1416 Ladies Watch is a casual style watch and is water resistant at 50 meters. The Marc Jacobs MJ3448 is a stainless steel watch with a gold tone case and bracelet. It features the logo letters M, A, R and C as the the numbers 3, 6, 9 adn 12. The Marc MJ3448 Ladies Watch is water resistant upto 50 meters and has a hinged snap clasp. The Marc Jacobs Sally MJ3455 is an all in black casual, stainless steel ladies watch. It features the Marc Jacobs logo on the dial, with silver-tone hands and a 60-second sub-dial at the six o'clock hour marker. The Marc Jacobs MJ3455 is also water resistant up to 50 meters for short periods of underwater use.